If you need a tablet that can operate and perfectly function in the most extreme environment, you want a rugged tablet that can stand different circumstances keeping your data protected. They are usually used by military servants, in retail, healthcare, field jobs, oil industry, etc. 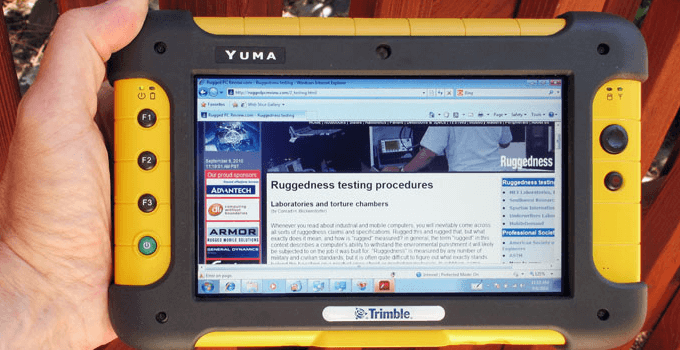 This overview gives you an insight into the world of rugged tablets and what they are able to endure. When it comes to tablets, they can be fully or semi-rugged. A fully-rugged tablet is adjusted to perform when the weather is really hot, whereby they are also water and dust resistant. They stay “immune” to vibrations, shocks and you if you drop it, it should take the hit undamaged. It is characterized by a stable and firm inner hard drive without parts that could move. This helps the hard drive to stay whole and immune to the above-listed situations. Usually, they are equipped with bar code scanners since they are often used in logistics. Semi-rugged tablets are usually rain-proof since they have an enduring case. They might come with purpose inbuilt accessories and are characterized by resistance, durability and easy access and use. There is no standardized level of ruggedness, but the tablets can be classified by certificates, and there are three main certificate classes. These certificates relate to the requirements and criteria defined by the EU directives and US norms that the devices have to meet. ATEX refers to the two EU directives that regulate the safety of workplace and equipment in hazardous areas. The places include work in an explosive atmosphere and others, whereby workers are supposed to stay protected and have the relevant equipment that will not jeopardize their health. Some devices (like a series of Samsung Galaxy tablets) are able to perform very smoothly under hazardous conditions and in the field. Some of them come with a range of options which are convenient for inspection and maintenance, material tracking, various operations, asset surveys, etc. their screens are usually well-protected and function like a real desktop as they are able to support different computer systems and CATs. For all those who need to document their work or some situations like damaged equipment, defects in maintenance or during inspections, they can opt for a tablet with a built-in camera which produces crystal-clear photos. Fully-rugged tablets can be of use in some industries, and in today’s day and age, they are probably mandatory in the oil and gas industry, pharmacy, chemical processing, etc. Even if it is an electronic device, no matter if on or off, that could trigger unwanted effects if exposed in an explosive atmosphere, ATEX-certified tablets have been designed with great care to be safe to use in a hazardous environment. When a tablet has an IP (International Protection) license, it means that it complies with the IEC 60529 standard which marks the level of protection against numerous things. For example, protection against intrusive body parts like a foot, hand, etc., water when electrical activities are taking place, against dust and unwanted and unintended contact with something. The IP protection has more than one level, but there are two major categories for each IP-protected tablet.we have the IPX which indicates a high degree of protection against solid particles, while the other IPY indicates liquid ingress protection. It is important to determine what kind of level and edition of the tablet corresponds to your needs and in what kind of environment you work. Public safety and mining jobs might require a very strong and durable device and that is why potential buyers need to check out what versions are out in the market and which meet their work environment needs. Usually, IP-approved devices, in general, are able to withstand accidents, different weather conditions, dust and rain showers, as well as accidental drops. When working in such conditions, carrying the device becomes part of the daily routine, so make sure that the tablet weight also works for you if you want to buy one. The tablet should be easy to carry all the time. The IPX and IPY classifications label a clear endurance and resistance level of the IP-approved tablets. The extensive explanation is good enough to figure out which tablet is good enough to “survive” under your work conditions. This certificate comes from the US and is known as the Military Standard. MIL-STD-810 tablets are also supposed to handle a lot of outdoor pressure and harsh conditions. They are designed to resist vibrations (unlike ordinary tablets), as well as to be dropped a number of times without consequences. These tablets are also equipped with specific features to resist different weathers. Protection against sand and dust exposure is also covered by the MIL-STD-801 tests, and even if dust protection does not sound serious like rain, it can get frustrating when a particle of dust or sand ends up accidently in one of your I/O ports, and eventually causes loss of valuable data. Therefore, check out the different levels of MIL-STD-810-approved devices if you work in extreme conditions.